Paddle craft are vessels such as canoes, kayaks, row boats, surf skis and stand up paddle boards. You are only required to hold a marine licence and register your vessel with VicRoads if the vessel is fitted with a means of propulsion (regardless of engine size). Under the Marine Safety Regulations all persons on board a kayak, canoe, rowing boat must wear a Type 1, 2 or 3 (Level 100+, Level 50 or level 50S) lifejacket at all times when the vessel is underway on any waterway. Operators of stand up paddleboards (SUPs) are required to wear a Type 1, 2 or 3 (Level 100+, Level 50 or level 50S) lifejacket at all times when the vessel is underway when more than 400m from the shore of any waterway. Wear A Lifejacket website has everything you need to know about: lifejacket laws in Victoria; what jacket you need to wear, when; choosing the right lifejacket for your lifestyle; and looking after your lifejacket. When operating canoes, kayaks, row boats, surf skis and stand up paddle boards you must carry the minimum safety equipment for human powered vessels, unless operating motorised kayaks and canoes, when you must carry the minimum safety equipment for powerboats. Make sure your safety equipment is in good working condition and is easily accessible. Display some identification on your vessel. Your car registration or a telephone number are good examples. This may assist with identifying who you are in the event you become separated from your vessel. Like all other boaters, paddlers should make sure that they know the boating rules applicable to any waterway they intend to use (see the waterway rules section for particulars) and the International Regulations for Preventing Collisions at Sea. Where possible, travel in a group to maximise your safety. Learn how not to end up in the water by using support and bracing strokes. If you end up in the water, stay with your craft – it is much easier for rescuers to see, and it enables you to reach for your safety equipment. Learn the paddle float rescue, paddle float roll, or re-enter and roll. The eskimo roll is the best and fastest self-rescue if overturned in a craft. How Many People Can I Carry? If the vessel is a decked canoe or kayak or is otherwise fitted with individual cockpits, the number of persons carried on the vessel must not exceed the number of individual cockpits in the vessel, irrespective of the age of the person. 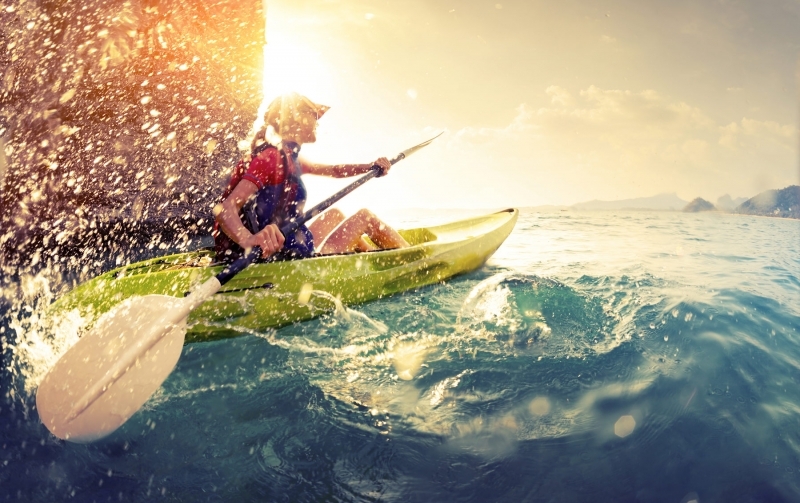 Sea kayaking is a magnificent recreation that can take you to many wild and pristine places along our coast. However, paddling a small craft involves risks that may prevent return to shore. Conditions change quickly at sea and your training and equipment are your greatest aids to survival. This section outlines the minimum safety equipment requirements for non-motorised kayaks, canoes and rowing boats operating both under and over 2nm from shore, as well as other safety equipment we highly recommend you carry. This is the minimum safety equipment required when operating non-motorised paddle craft less than 2nm from shore. A Type 1, 2 or 3 (Level 100+, Level 50 or level 50S) lifejacket at all times when the vessel is underway on any waterway. A Type 1, 2 or 3 (Level 100+, Level 50 or level 50S) lifejacket at all times when the vessel is underway when more than 400m from the shore of any waterway. A bailer or sponge (if no electric or manual bilge pumping system). While not required by law, we strongly recommend paddlers invest in - and learn how to use - the following safety equipment. A paddle leash will keep your paddle nearby and acting as a sea anchor while you right your craft and get back in. Inflatable paddle floats are low-cost, lightweight and can greatly assist in self rescue. It slips onto one end of your paddle and is then inflated. Once the float is inflated, the other end of the paddle is slid under your deck grab lines and the paddle float acts as an outrigger, stabilising the kayak while you climb back in and then bail out water. Here's a great step-by- step animated guide, but it's always best to attend a professional training course. Personal locator beacons may be carried instead of EPIRBs if you are paddling less that 2nm from shore. To be found more quickly be sure to select a beacon that has GPS as well. And make sure you know how to use them - the AMSA website has some great information. Clothing is one of the key considerations when going paddling - you must get this right in order to enjoy kayak safely and make the most of your day paddle. Never wear cotton. Not even jocks or socks! When it gets wet, cotton doesn't dry and remains cold and heavy! Block wind, sun, rain and sea spray! Are highly visible and reflective - you want to be seen by other water users day and night! The East Coast Kayaks website has some great information on what to wear when kayaking in Victoria. This is the minimum additional safety equipment required when operating non-motorised paddle craft more than 2nm from shore. Must be waterproof and buoyant. One pair of spare oars or paddles with rowlocks. These can be seen for up to 4km (10km by aircraft). They should be used in daylight to pinpoint your position. They must comply with Australian Standard AS 2092 "Pyrotechnic marine distress flares and signals for pleasure craft". These have a visibility range of 10km, are designed for use at night but can also be seen during the day. They must comply with Australian Standard AS 2092"Pyrotechnic marine distress flares and signals for pleasure craft". 406MHz EPIRBS only. Must be registered with Australian Maritime Safety Authority and comply with Australian and New Zealand standards. The In an emergency section of our website has information on using distress beacons. A magnetic compass is the most important piece of direction finding equipment a master can have, particularly in bad visibility or out of sight of land. Electronic equipment such as a GPS and battery operated hand held devices are useful supplements but can fail when electrical power runs low.